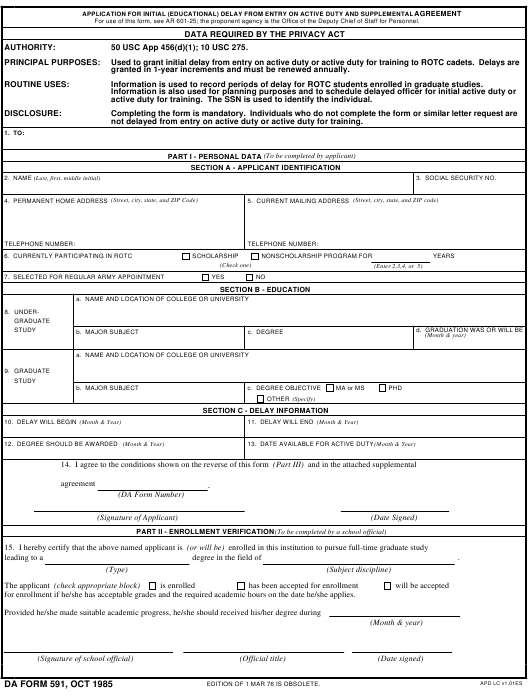 DA Form 591 or the "Application For Initial (educational) Delay From Entry On Active Duty And Supplemental Agreement" is a Department of the Army-issued form used by and within the United States Military. The form - often incorrectly referred to as the DD form 591 - was last revised on October 1, 1985. Download an up-to-date fillable DA Form 591 down below in PDF-format or look it up on the Army Publishing Directorate website. granted in 1-year increments and must be renewed annually. Information is used to record periods of delay for ROTC students enrolled in graduate studies. active duty for training. The SSN is used to identify the individual. not delayed from entry on active duty or active duty for training. for enrollment if he/she has acceptable grades and the required academic hours on the date he/she applies. EDITION OF 1 MAR 76 IS OBSOLETE. 16. An approved delay is subject to the conditions listed below. attached hereto upon termination of my delay status rests with the Department of the Army. c. Further delay for education reasons is not authorized after receipt of the degree shown in item 9c. military requirements (Not applicable to special medical program participants). e. Delay may be terminated by Department of the Army at any time because of overriding military requirements. other reasons, active duty will be scheduled as soon as possible after the date shown in item 13.
g. Request for renewal of delay must be submitted annually. h. The following information must be promptly reported to the Commander, ARPERCEN, 9700 Page Blvd., St. Louis, MO 63132-5260. (1) Failure to continue the education for which delay was granted. (2) A move or transfer from the educational institution shown in item 9a. (3) A deviation in the field of study shown in item 9b or a change from fulltime to part-time study. school officials as tends to indicate a lack of suitable academic progress. (5) A degree is granted. (7) Any other information that may influence the continuation of an approved delay. and must be renewed annually. furnished you approximately 150 days before the delay ending date. In approving this delay, you are reminded of your responsibilities as set forth in the conditions contained in Part III of this form.